According to the Food and Agricultural Organization, "On average, a person needs about 1800 kcal per day as a minimum energy intake." (A kcal - kilocalorie - is a measure of food energy, also known as the Calorie). For comparison, the US government recommends 2,500 per day, on average (a recommendation that is certainly exceeded by most people, but I digress). The unit of kcal/person/day provides a useful basis for evaluating total food supply as compared to population. The graph at the top of this post shows such an evaluation, based on data downloaded from FAOSTAT (thanks RTC!). 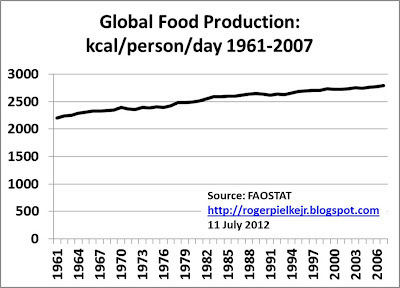 The data show that from 1961 to 2007, when the dataset begins and ends, global food supply in kcal/person/day has steadily and consistently increased such that it has been for many decades comfortably above the level deemed necessary to meet individual nutritional needs. In fact, if food supply distribution were perfectly efficient (which of course it is not) the world could feed an additional 1-3 billion people with the food produced in 2007 (depending on your view of nutritional requirements). This can be hard to reconcile with the fact that in 2007 the UN found about 1 billion people globally to be "undernourished." So there is considerable "headroom" for progress even without increasing global food supply, and UN data show progress in recent years. 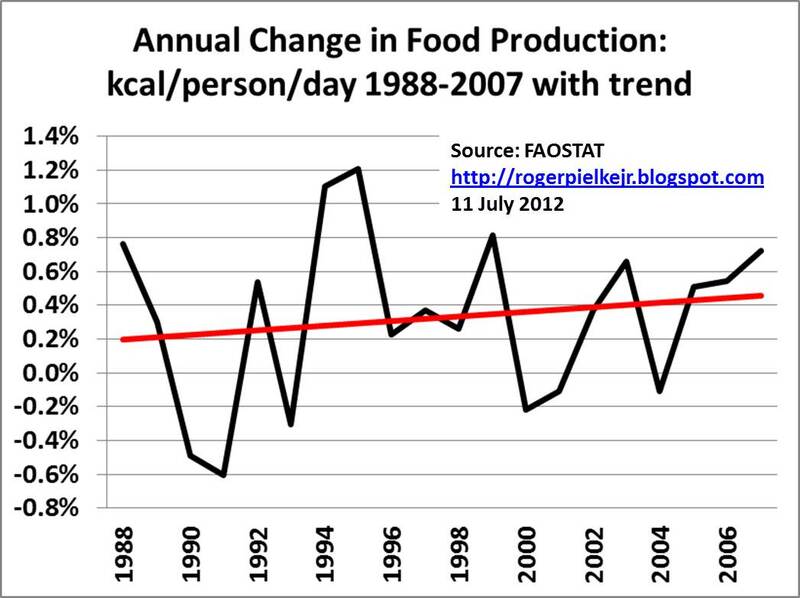 Food production has not only kept pace with population growth, it has outstripped it. The world now produces more food than ever, and even countries that were once practically synonymous with famine have achieved self-sufficiency in staple foods... hunger is a problem of poverty, not scarcity. 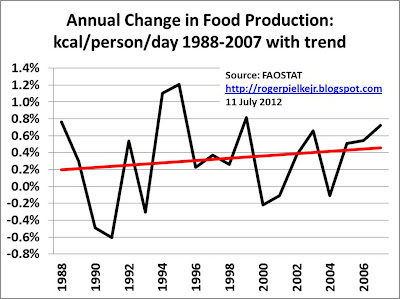 [W]hen you look at the facts, there is no “agricultural” reason for hunger today. Global food production has increased more quickly than population over the past half century, and the EU and USA even had to bring in policies to get rid of “mountains” and “lakes” of food and drink. Let's dig a little deeper into the numbers. The graph above shows the annual rate of change in kcal/person/day for the 20 years ending in 2007. The red line shows the linear trend in kcal/person/day, and shows that the annual rate of growth has just about doubled over that time period. The data illustrate that food supply has been growing faster than population, and this trend has been accelerating (which probably owes to a slowdown in population growth rates in addition to effects from agricultural intensification). What does this data mean from the standpoint of discussing agricultural policies? I can think of several things. 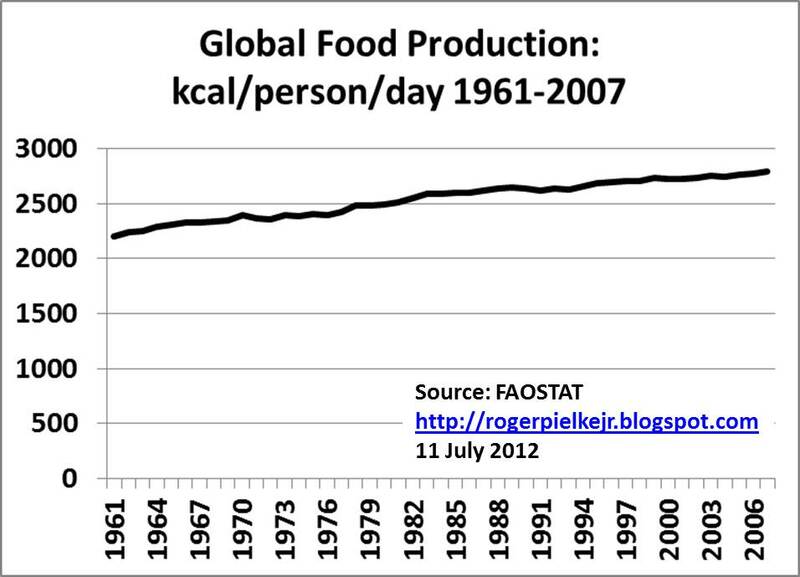 1) It can be misleading to talk of a global "food supply" problem. Certainly, sustained improvement in agricultural productivity will continue to be important, but at present does not appear to be a limiting factor in meeting global nutrition goals. Talk of the need for a "second green revolution" not only fails to accurately reflect the so-called "first green revolution" (more on this to come) but also distracts from the fact that supply is presently not a limiting factor in meeting global nutritional goals. 2) Over many decades the global agricultural system has shown itself to be very robust to a range of shocks, including the widespread pattern of climate anomalies of the early 1970s, financial crises, and rapidly changing prices of inputs (notably energy). However, there could be unforeseen major shocks yet to come, including disease (e.g., wheat rust) and rapid climate changes (e.g., from a massive volcanic eruption). Policy should focus on the robustness of agricultural systems to such shocks. 3) The issue of global food is ultimately as much (if not more) a problem of distribution, poverty and governments as it is an issue of technological innovation. From where I sit it seems that far more attention it paid to the latter than the former. Every call for a "second green revolution" should be met with a reply focused on the social and political factors that affect meeting nutritional goals. Finally, in my explorations of issues of food (the subject of several papers in the works and a chapter in my coming-into-focus new book), it seems that a focus on yield, productivity and total production (all important, of course) can obscure the larger focus on the ultimate goals of food policy -- feeding people. This post argues that an important but underutilized (in policy discussions, that is, perhaps not among specialists) metric of kcal/person/day can help to keep our attention on that larger focus. Evidence-Based Policy: Which Side are You On? Krugman vs. Research, Who You Gonna Believe?